Jamie was born into a family of gifted Cherokee healers in Upstate New York. At an early age her grandmother, a renowned psychic and medium, inspired her to explore the gifts woven into her tribal heritage. Her journey to embrace these gifts has led her to studies in the art of Tarot, palmistry, Reiki energy work, Zen Buddhism and Medical Herbalism. The combination has enhanced her ability to guide others on their unique journeys. She has been a professional Tarot Card Reader for 15 years and she calls upon her own insights, as well as the insights of her ancestors, in her readings. Her readings are infused with a lightness that helps others to see the silver lining of any situation without invalidating the truth of difficult circumstances. She seeks to empower others through the wisdom of the tarot and does so with grace, humor and radical honesty. 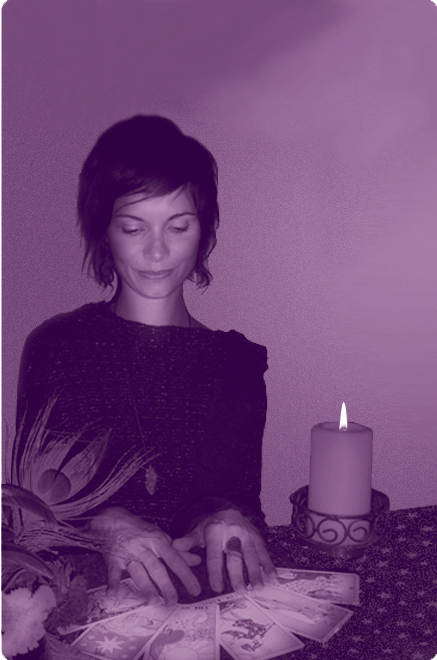 Her readings are experiences of discovery and intuitive guidance for those seeking counsel. Tarot card reading is a mystical tool, first used for fortune telling in the 1700's in Paris, that can help answer questions you may have on your path by offering clarity and truth into any situations regarding career, love, travel, illness or spiritual purpose. There is no mathematical equation or cognitive understanding that can be applied. The cards work by tapping into your true nature and exposing what you already know on a deeper level to be true for you. Jamie is available for small and large groups and private readings serving the bay area. She can be reached at (505) 690.3185 for scheduling and fee information.